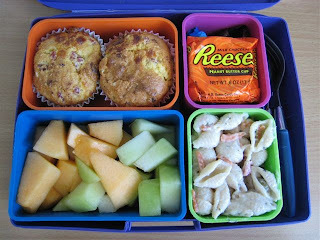 He has 2 ham & cheese stuffed muffins, mixed melons, Faith's pasta salad and some mini-Halloween candy bars (peanut butter cup, Almond Joy, Hershey's & Milky Way). The kids had the same thing, minus the candy bars, but since we were home, they got plates. I think you have posted this before but I can't find it. How do you make those ham and cheese muffins? My son would love those!